"Do you want to build a snowman?" with Google Slides. 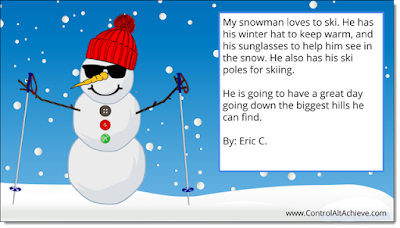 Eric Curts created a great resource for students to build their own unique snoman/snowwoman and write about it. I worked with students today and they were so engaged in building their snowman as well as their description of their creation. You will need to use the link below The reason you will need to share this exact link is that it will create a copy of the project that Eric created for them in their Google Drive. If Eric's link does not work - try this link. Remember to open it and make a copy in your own personal Drive. See below. Embedded below is a GIF showing the basics of the site as well as a 4 minute and 50 second YouTube tutorial I created. I also included Eric's 10 minute and 51 second detailed video as well.